HSTOnline allows you to choose how grades are to be calculated for your students, using either the traditional Averages method, or by dividing the total points earned by the total points possible. You must choose one method for all students. You may change your selection at any time. Make your selection in the Program Options menu. The options are outlined below with examples demonstrating how the different options may affect your student's overall grades. The Student - Grading Overview will show exactly how each Term grade was calculated using the grading method you selected. You can grade one, some, most, all or none of your Student's Assignments. It is entirely up to you. In order to generate an entry for a Subject/Course on the Report Card or Transcript you need to create a minimum of one completed, graded Assignment for each Subject or Subject/Course for each term. Directions for creating minimal entries for these reports can be found in the Report Card or Transcript Help Pages. Edit the Assignment you wish to grade. Enter the points possible for the assignment. This can also be entered when creating the Assignment or Lesson Plan item. Enter the points earned for the assignment. Check the Teacher box in the Complete field. As soon as all three of those fields are filled accordingly, HSTOnline will display the percentage grade for that Assignment. The Previous or Next hyperlink in the top right corner to save your changes to this Activity and move to the previous or next Activity in the list. You can click or touch Previous or Next until you have made all the changes you want to your Activities and then click the Save button to end the Edit process. If you reach the beginning or end of the list when clicking or touching Previous or Next, the Edit window will close and you will be returned to the list view. If you wish to apply Pass/Fail grades to your student's work you will want to set up a Grading Scale to award those values. You will still need to enter points possible and points earned, but you can enter simply 1 point possible for these items, and then enter 1 point earned for passed items and 0 points earned for failed items. It is customary that Pass/Fail grades not be included in the GPA calculation. 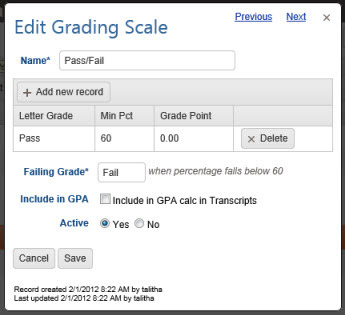 To that end when creating a Pass/Fail grading scale, we recommend that you uncheck the box to 'Include in GPA Calculation in Transcripts. The choice, however, is entirely up to you. In this method, a percentage grade is calculated for each completed Assignment with a Points Possible value greater than zero. Those grades are then averaged together for an overall Term grade. Term grades are averaged together to generate a Yearly grade and reported on the Report Card and Transcript. Grades are only calculated for Assignments which have points possible value greater than zero and a check in the Teacher box of the Complete field. HSTOnline calculates the grade for the assignment by dividing the points earned for the Assignment by the points possible for the Assignment. The percentage grade is displayed in the Grade field of the Assignment Edit window, in the Grade column of the Agenda - List View, and in the Assignment Tool Tip of the Agenda - Calendar View. attributing a letter grade based on the Grading Scale you have selected for the Course. Yearly grades are determined by calculating a simple average of the Term grades that have already been calculated and rounded according to your option settings. A letter grade is attributed based on the appropriate Grading Scale. (88 + 87)/2 = 87.5% which becomes 88%. In this method, a percentage grade is calculated for each completed Assignment with a Points Possible value greater than zero so that you can see your Student's progress on each graded item. However, with the Sum of Earned/Possible option selected, Term grades are calculated by taking the total points earned for all completed Assignments and dividing that value by the total points possible for all of those items, essentially treating all of the individual Assignments as one single Assignment for the Term. Term grades, rounded to meet your option settings, are averaged to calculate a Yearly grade as reported on the Report Card and Transcript. Yearly grades are determined by calculating a simple average of the Term grades hat have already been calculated and rounded according to your option settings. A letter grade is attributed based on the appropriate Grading Scale. points possible of 500 and a total points earned of 418.